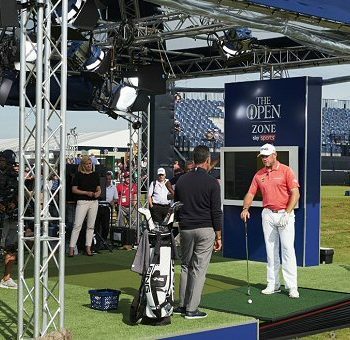 SHEFFIELD, UK – When The Daily Telegraph recently reported how Major-winners were turning to Southport-based Tour coach Phillip Kenyon to transform their putting, eagle-eyed readers may have spotted a reference to golf’s new secret putting weapon – the Green Stage, by Zen. With 2016 Major victories, late-season surges in form and stellar performances at the Ryder Cup all following recent sessions with him, many of the world’s best-known Tour superstars now turn to Kenyon when they want to improve their form on the greens. And when they visit Kenyon’s studio at the Harold Swash School of Putting, located at the Formby Hall Golf Resort Hotel & Luxury Spa in Southport, Tour stars regularly spend time on the adjustable slopes of the Green Stage. “The Zen Green Stage allows us to create any type of makeable putt on the planet, within seconds” said Phillip Kenyon. “If you collect data on both straight and breaking putts, you get a much truer picture of how the student carries his/her stroke patterns onto the green. “Green Stage creates the ideal training environment when working through stroke changes and drills”. The world-first, computer-controlled Green Stage – developed and built in Sheffield by Andy McCague, Nick Middleton and the team at Zen Green Technology – enables golfers to practice an almost limitless number of breaking putts to their heart’s content, mastering the art of green reading in a comfortable indoor environment. The Green Stage, which is available in three sizes from 12 to 20 feet in length, takes seconds to adjust from one slope to another, and can offer golfers challenging double-breaking putts as well as all other putts in the scoring zone. When combined with the other technology at Kenyon’s disposal, including SAM PuttLab, Quintic Ball Roll, GASP high speed cameras and software, and 3D analysis systems which measure the body’s movement, the Zen Green Stage is proving formidably useful in transforming pupils’ fortunes on the greens. “With the constraints of the British weather, it is hard to capture the right putting data outdoors” said Kenyon. “Having the Zen Green Stage at the studio here has been a big step forward for us. We can capture all of that date across each of the different putt types – uphill, downhill, sidehill, and double breaks – in a controlled environment. “The Zen Green Stage creates a much more effective putting coaching process” he continued. “We can see how a golfer tackles an emerging environment, typical of what they will find on the golf course, rather than simply assessing them on a flat surface. 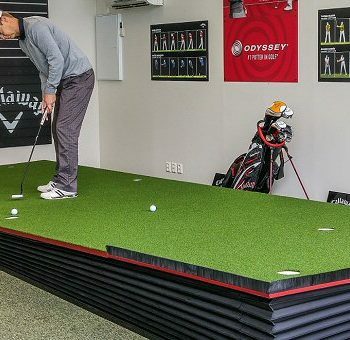 Green Stage enables us to create an ever-changing putting experience indoors – which makes for a far more enjoyable environment for the golfers who come here to improve their putting. AS USED BY TOUR PUTTING COACHES. Your pro teaches you how to putt.